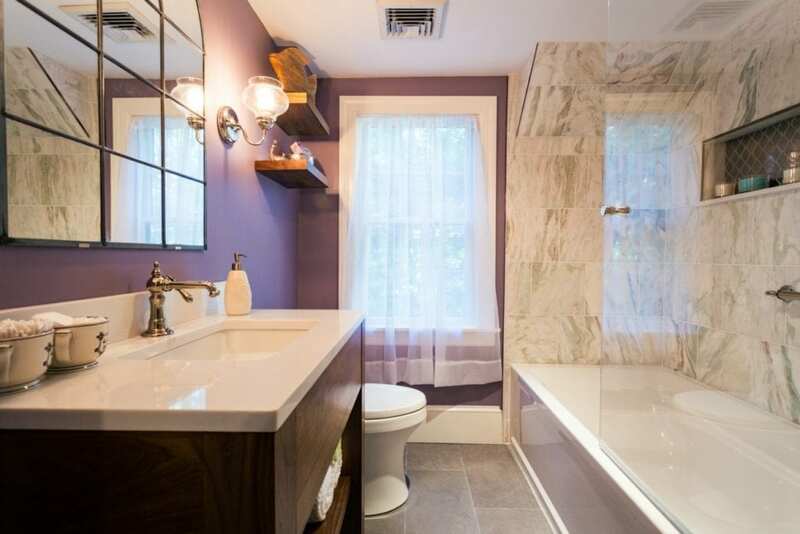 Probably the smallest full bath you could have is a 5ftx7ft space. In a small space like this it is possible to fit the 3 necessary pieces with some options mentioned below. If your space is small, one thing to consider is a pocket door which will eliminate the concern about the direction the door will open, and therefore, be less intrusive. Another element to consider is what will you see when the door is open. Do whatever you can to make that piece be one that is pleasant to look at such as a a vanity or sink with beautiful fixtures, not the toilet. Often toilets are place where the eye can’t see when passing by the room such as tucked in a corner or behind a door opening. 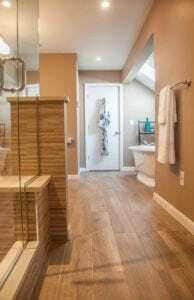 If you have the luxury of a medium to large space for your bathroom, you will also have many options and important choices to make so dig right in and enjoy the remodel process. Which way will the door open? What happens when the shower door opens? Where will the toilet be located? Will a pocket door help the area to function better? Will the bathroom fit the needs of the intended use? How will the traffic flow? Make a decision about a bathtub, is it necessary or wanted? 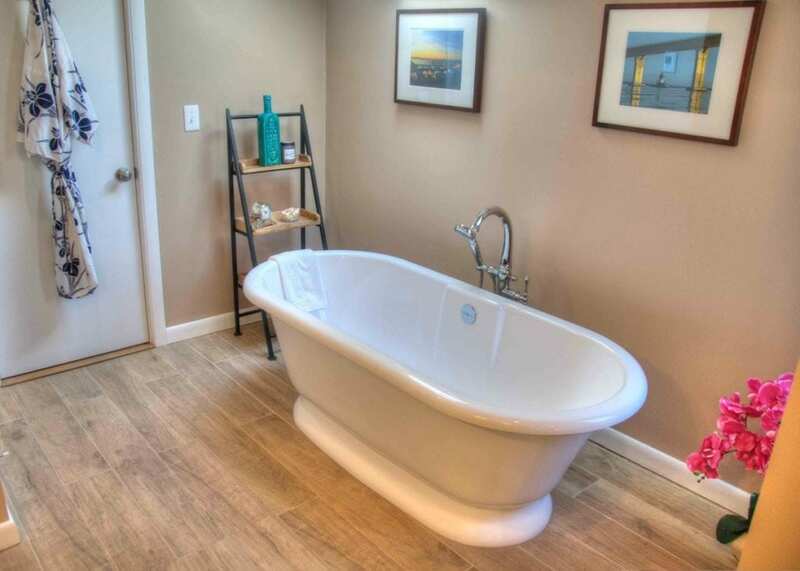 Are you planning to use a tub or is it something you think you need for resale purposes? If you know this is your forever home and a tub is something you never use, then feel free to let it go. 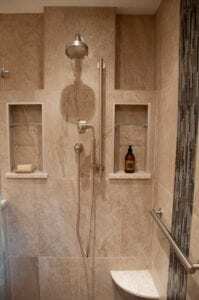 As we age, it is more difficult to get in and out of a bathtub and there are thousands of beautiful shower options in terms of size and function. 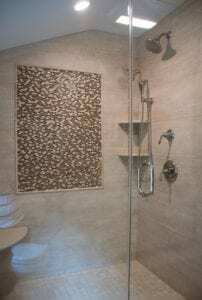 A walk in shower is a great alternative for luxury and relaxation. Clear glass enclosures can create the illusion of space even in the most cramped spaces. 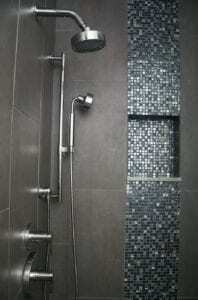 Many showers have built in seats which are not only great for the elderly but also for bathing young children. Another option is a recessed niche. These serve as a decorative focal point as well as additional storage in the tub or shower. If you love relaxing, there is nothing more luxurious then your own tub. Think about where the tub will be located and who will be using it. You can also save space by opting for a tiny tub. You will need to take time and assess your needs to make an informed decision about the need for a bathtub versus a shower with amenities. 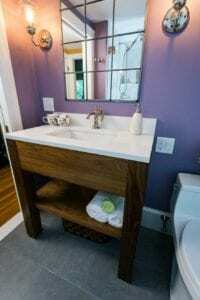 The standard height for a vanity has long been 30 inches. However, these days you can purchase a vanity that can be as high as 36 inches, which saves your back from daily strain and works better for most adults. It also provides extra vertical storage space without using horizontal space. If this height is too high for you, consider a floating vanity which can be attached to the wall at a height from the floor that is convenient to your needs. When deciding on a vanity, choose either a single or double sink. Ask yourself, will more than one person use the bathroom at the same time? If so, and space is not a concern, then a double sink would be suitable. If space is an issue, a pedestal sink might be what you need. It takes up minimal space, gives the illusion of more room due to a single pedestal on the floor, but does not provide any storage. 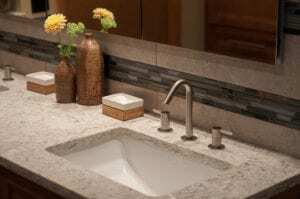 A corner sink is another great space saver that will create a unique look. 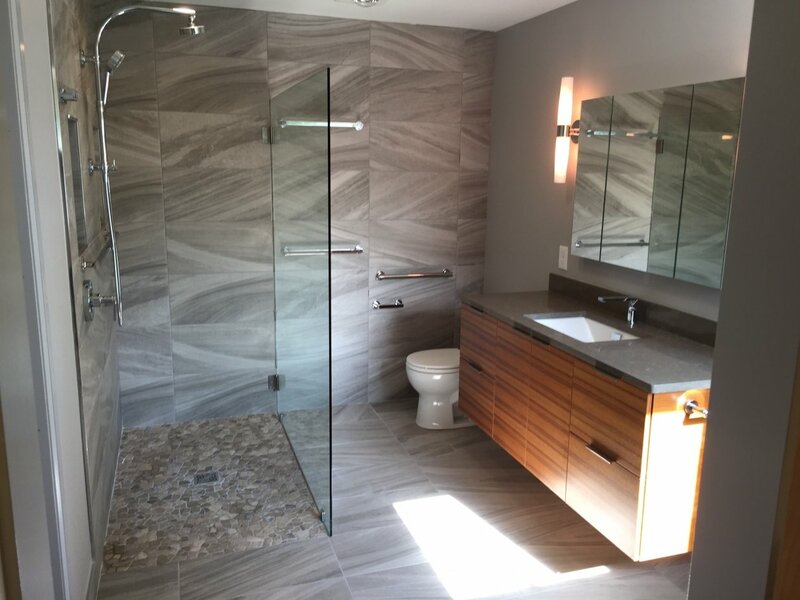 Each decision that you make in the process is important, working closely with a team will ensure that your vision becomes a reality and that your bathroom functions in the best way possible. In this world of being green, there are many options for toilets that use little water yet flush efficiently. Just as the height for vanities has risen, so has the height for toilets, even those that are not considered handicap. Toilet heights are designed to be at the same level as a typical chair. This is suitable for any adult sized person. If space is a concern, consider a floating toilet which is attached to the wall and has no base on the floor. This gives a clean, sleek look to your bath with a modern design. You also want to create a design that keep the toilet out of view. The last thing you want to see first is the toilet, it will detract from the appeal of your new bathroom. 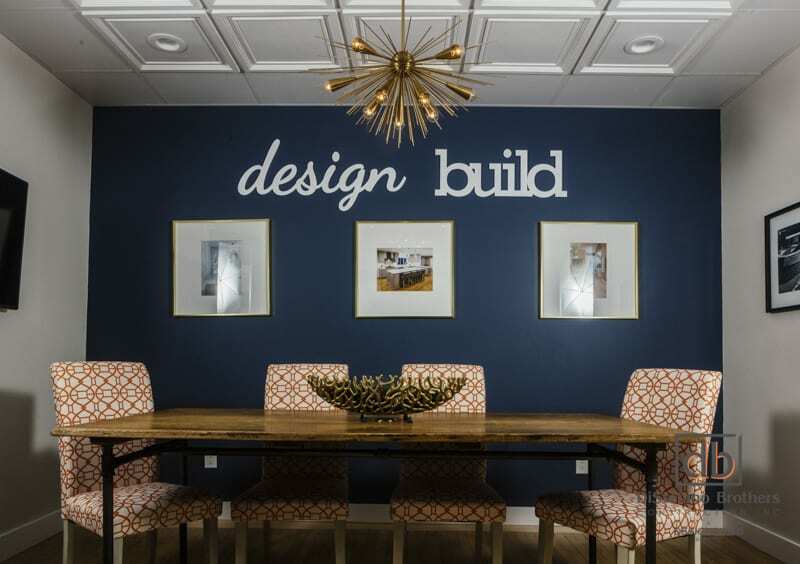 Lighting can be decorative as well as functional. 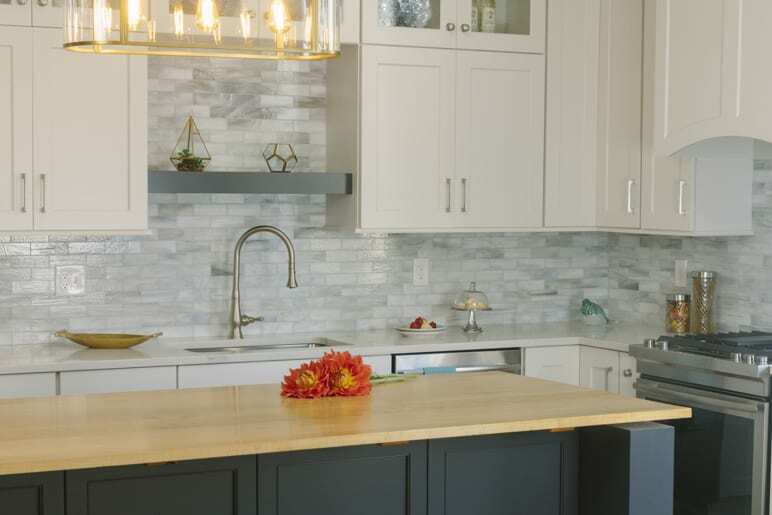 There are many choices including ceiling lights, vanity lights, recessed lights, accent lighting, below counter lights, inside shower lighting and decorative sconces to name a few. Again, assess your needs, space, and style and choose those that work for you. You will most likely opt for a mixture of lighting types so that your bathroom is stunning and functional. Our Design team will give you options that will enhance the look of your bathroom while meeting your lighting needs. Today’s shower experiences are refreshing and exciting. Starting with a standard shower-head you can move on to body sprays, handhelds, rain heads and more. Determine your needs along with your vision when deciding the most appropriate style for you. In addition, your team will help to plan the location of these elements. You will need to consider height, usage and visual appeal when choosing your water fixtures. The placement of these items, which are always a necessity, are often the last consideration on the list. They actually should be one of the first so that they can be included in the wall and tile design. A bathroom is probably the most hazardous area of your home and the use of towel bars can double as grab bars to help keep your family safe. 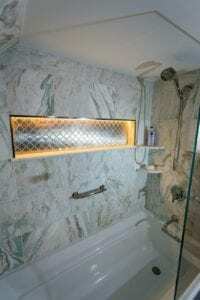 Bathroom ventilation is another area of priority to consider. An exhaust fan should vent the air to the outside of your home, not simply to the space between the ceiling joints. This helps to control and prevent the buildup of mold and mildew. Better models have a whisper quiet exhaust fan and humidity control switches that activate when a sensor detects excess moisture in the air. 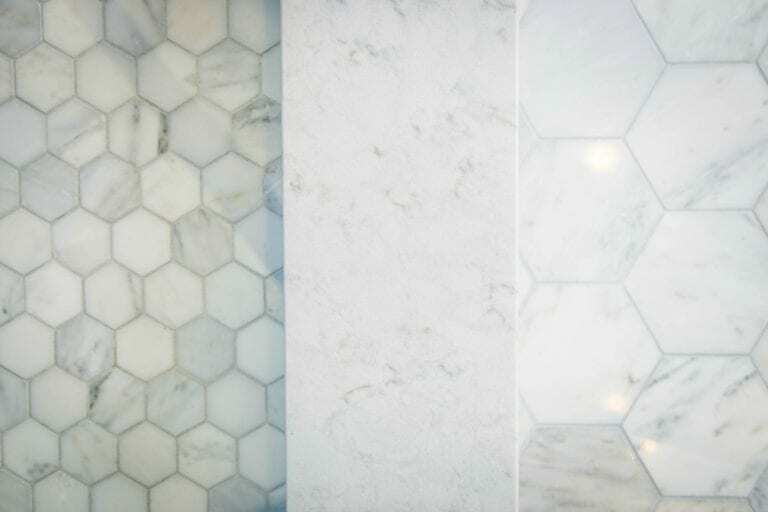 Common choices for bathroom floors are ceramic tile, porcelain tile, natural stone, and marble. Always consider choosing a surface with a non-slip finish for the safety of your family. Additionally,think about where the floor will meet the hardwood. This transition is important to the aesthetics of your bathroom, but it is often overlooked. 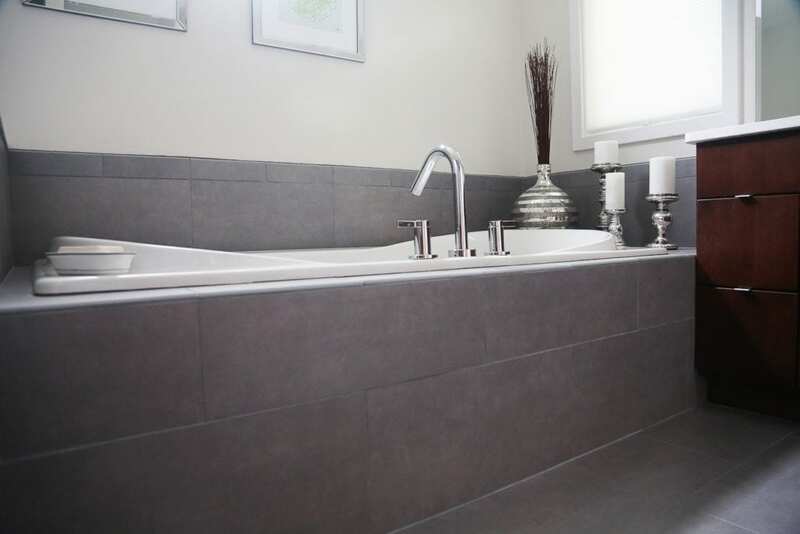 You can enhance the luxury and comfort of your bath by adding heating elements to the flooring to warm the surface. No matter what size your bathroom is, there never seems to be enough storage. A vanity often allows for storage of items below in drawers and cupboards. 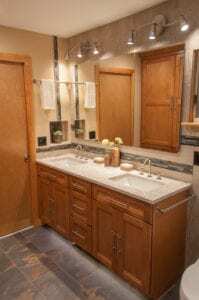 However, you do not want to choose a vanity that impedes the traffic flow in the bathroom. If your bathroom is large enough, a linen closet can provide plenty of storage. The style of your bathroom should reflect your vision and compliment the rest of your house. You will want to work closely with a design team to ensure that the bathroom flows with the style of your house yet provides you the updated look you are seeking. 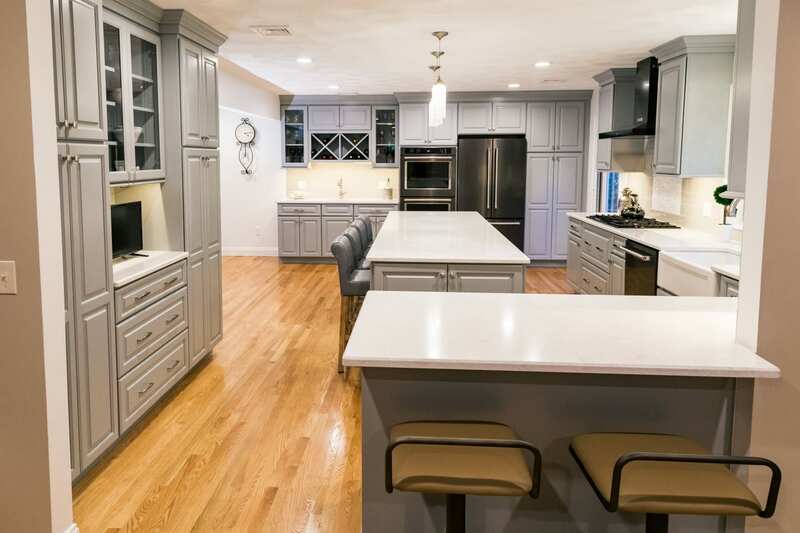 At DiStefano Brothers Construction, we offer you the luxury of working with a team of experts. 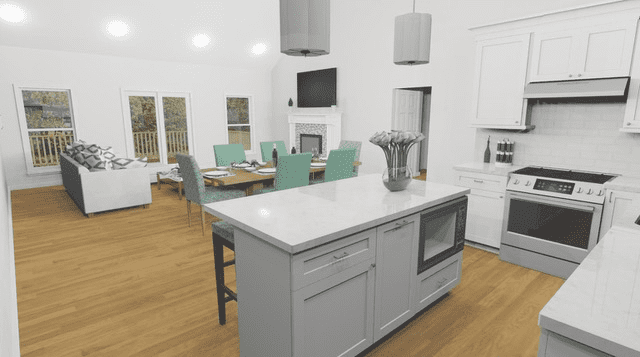 From consultation to design and from installation to outcome, you will be guided by professionals throughout the project. We look forward to making your vision a reality!